Local isn't just a buzzword any more - it has become a way of life for people from Portland, Maine to Portland, Oregon. At farmer's markets and restaurants, local foods command a premium price, and the same goes for plants, too. Homeowners know that locally grown shrubs are better adapted to their climate, and they want to support business in their community, state, or province. Local Roots® is your opportunity to show that you're a part of this, too. This exclusive program was created especially for our customers who grow and sell regionally. It is designed to give you the flexibility to create a flowering shrub and landscaping program specially tailored to fit your local market. Spring Meadow offers over 150 non-branded varieties, including super hardy plants like Mega Mindy® panicle hydrangea and warm climate classics like 'Goshiki' osmanthus. Specialty growers can take advantage of niche plants like edible 'Chicago Hardy' fig or flashy variegated Cat's Eye™ kerria. 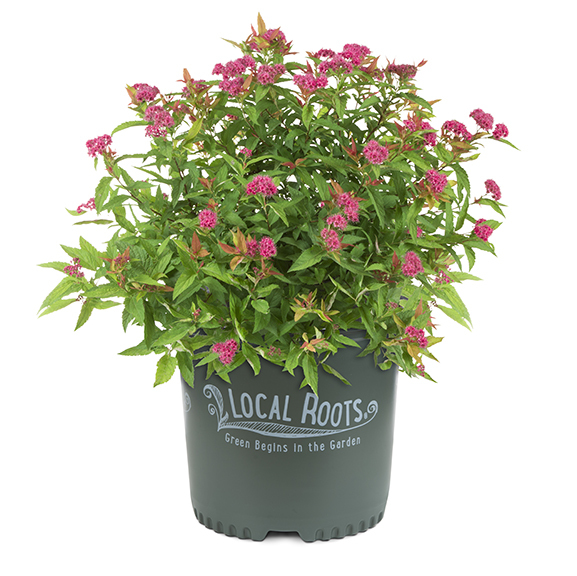 Even landscape staples like 'Smaragd' arborvitae and 'Gro-Low' sumac take on a new appeal with Local Roots packaging.